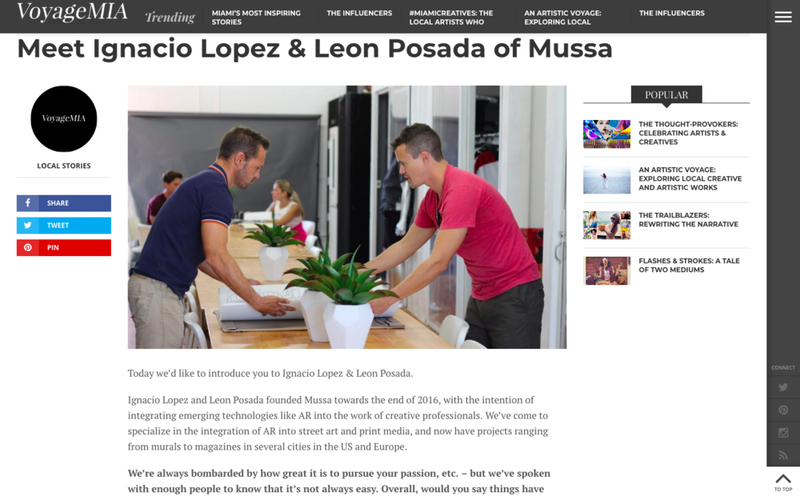 Mussa was founded in 2016 by Ignacio Lopez and Leon Posada to create immersive experiences with Virtual Reality and Augmented Reality tools and applications. Specialising in the integration of AR with street art and print media, they take inspiration from Miami and its art scene. Both experienced in technologies and design, they are targeting artists, galleries and other creatives. So two of our projects were showcased at the Adobe Max Conference in Sacramento last week. Adobe put together an intro video for the keynote presentation depicting the current state of the AR landscape... It was brief, but it was awesome to see @birdseedanthony 's mural and its AR content in such a big stage! Our client's works have been featured in shows and publications in the US and Europe, including the Miami VR Expo 2018, Miami's Art Week 2017, and gallery spaces in Spain, Colombia, and along the US East Coast.